Bihari farmers will showcase their very first one liter sample of distilled lemongrass oil, harvested in January, at the National Farmer’s Fair in Lucknow. Inspired and organized by CSIR-CIMAP, the 1.5 acre field produced only a small yield due to the drought in Hadiyabad, Bihar. With high hopes for larger yields in years to come, however, the aromatic oil will be given a seat of honor. 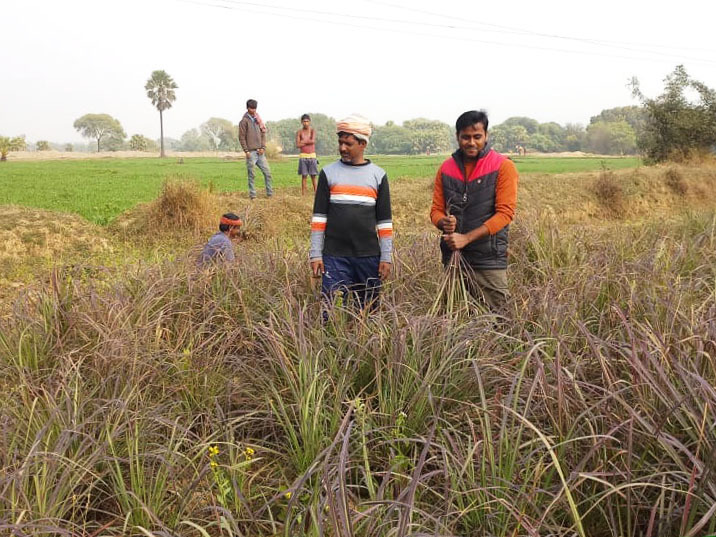 The harvested lemongrass was taken to the nearby town of Ara for distillation at Krishna Vigyan Kendra (KVK), a center that provides information and agricultural technologies resources to local rural farmers. With the help of Nand Kishor and Amrita SeRVe agricultural officer Ghanshyam, the farmers distilled the first precious drops of lemongrass oil. Water, compost, and rest will help the prized lemongrass field prepare itself for the next crop in a few months.